Firstly, we need to recognise that our current predicament is a product of our inability to banish sectarianism from our political interactions. Sectarianism is not a secondary feature of the Lebanese political system; it’s the main constituent that manifests itself in confessional arrangements. And five years on from the ‘Cedar Revolution’ we need to recognise that the events that followed it have contributed to the strengthening of sectarian leaderships. It might have seemed at the time that seeing Samir Geagea and Walid Jumblatt together meant that we’ve opened a new chapter in our history. Far from it, the alliances that were created after the assassination of Hariri were explicitly set up as coalitions between sectarian groups. This is as true of the Geagea – Hariri alliance as it is of the Aoun – Hezbollah front. The cumulative effect of all those sectarian arranged marriages was a further erosion of any potential for secular politics. It’s not by coincidence that the assassinations that followed targeted some of the leaders that did not have sectarian affiliations. 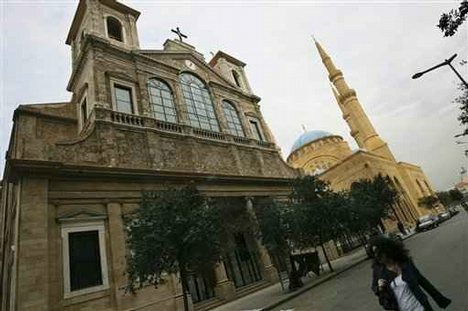 Given the centrality and importance of Beirut to national politics, it has increasingly become the main battleground for sectarian confrontations. I don’t mean by that only the skirmishes in ‘mixed’ areas such as the Burj Abi Haidar incident, but the whole range of political manifestations starting with the March 8th and 14th demonstrations to the Riad El-Solh camp to May 7 events. It’s time that we see all those events for what they were: displays of the sectarian power struggles that further eroded any possibility of national unity. Today we are astoundingly still being asked to choose between the two camps that have contrived to create and sustain a poisonous atmosphere of mistrust and animosity over the past five years. In other words, we are being asked to contribute to our own self-destruction and supply the fuel for the battles that precede settlements between sectarian leaders. Isn’t it time that we reject those offers for assisted suicide? The end of this era of Lebanon’s history is an opportunity to develop alternative forms of politics that are grounded in secularism and aspirations not sectarianism and fear. But while we organise and prepare for that, we should realise that any choices we make between the two camps are inevitably choices between sectarian coalitions. Let’s start by rejecting the calls to choose the least disagreeable option. And, for God’s sake, let’s stop believing the fear scenarios that come straight out of 50s B-movies. You have my personal guarantee; there aren’t 3000 members of Hezbollah with ‘long beards and long nails’ hiding in chalets in Christian areas.